by Kerry Patterson, Joseph Grenny, and others. McGraw Hill, 2012. The authors are business and management consultants and co-founders of VitalSmarts, a corporate training organization. 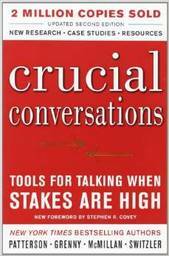 In this secular book, they argue that the higher the stakes, the more likely we are to either avoid a “crucial conversation” or to handle it badly, and the higher the stakes, the worse the consequences of such failure. This practical, how-to book with numerous examples from the workplace and the family setting, teaches effective communication techniques for challenging encounters, “crucial conversations”. The focus is on personal effectiveness, and each chapter closes with a summary of takeaways. Topics covered include: advance preparation for significant conversations; creating safe space for difficult topics; effective listening; managing anger, fear and hurt; and getting results. The book includes links to a website with entertaining video illustrations and other tools. Any congregational leader seeking to improve his/her communication skills and assertiveness in handling important or controversial situations will find this book helpful.